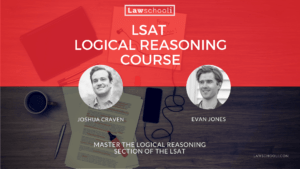 LSAT logical reasoning strengthen questions are very similar to the weaken questions we covered last time, but instead of trying to kick the argument over, you are trying to keep it up. Unlike with weaken questions, where we try to show that the conclusion may not follow from the premises, with LR strengthen questions your goal is to really nail the conclusion on the premises tightly. Remember our house metaphor: an argument is like a house — the conclusion is the roof, and it’s held up by the premises. With strengthen questions, you look for an answer choice that makes that house more sturdy. If you feel you need a refresher on basic argument structure, read this post on main point questions. Here’s a big difference to watch out for: often with logical reasoning strengthen questions you’ll get a question in the EXCEPT form. You’ll be given 5 answer choices, 4 of which strengthen the argument, and one that doesn’t. You have to find that one. That can be tough, so we’ll talk more about it later. Despite that wrinkle, I think that for most people strengthen questions are easier than weaken. People are good at bolstering their own arguments. Use this skill, which I’m sure is already at a high level, to attack these questions. The idea is to take ownership of the argument: after you read the passage and see that it’s a strengthen question, then pretend it’s you making the argument. That will make it easier to spot an answer choice that makes “your” argument better. The best book to learn LSAT strengthen question techniques is the Powerscore™ LSAT Logical Reasoning Bible. It’s advice will complement the strategies you learn here and give you practice with real LSAT questions. The first thing you have to learn with strengthen questions is how to spot one when you encounter it. Luckily, this part is easy. There’s just going to be some language about making the argument stronger, supporting it, or strengthening it. That’s why we call these “strengthen” questions. I co-wrote the tracks for my latest album with a professional producer, rather than doing it all myself as I did on my debut album. The new album sold really well as a result of the collaboration, so I should definitely work with a producer on my next album, so that one has strong sales as well. What’s what in this argument? “I co-wrote the tracks for my latest album with a professional producer, rather than doing it all myself as I did on my debut album” is just background information. It’s not really part of an argument. I should definitely work with a producer on my next album, so that album has strong sales. That’s the conclusion. It’s a pretty definite conclusion to draw on the basis of scant evidence, but that’s what our musician is choosing to argue. The above conclusion is supported by a little premise (probably better thought of in this case as evidence), the new album sold really well as a result of the collaboration. He/she thinks that this will happen again if they collaborate on the next album. This is a pretty weak argument. The idea that a future collaboration is going to sell better is just supported by that one thing, that this new album was a collab (yeah that’s an abbrev for collaboration) and it did well. Now, you might have thought strengthen questions would all start off with some really weak-as-hell argument like this one, and that it will be your job to make it okay. However, that’s not really how it works. As often as not, the argument is pretty solid, and you just have to make sure it stays that way. My point is that you don’t want to get too obsessed with looking for some flaw in the argument that you’ll have to fix. Sometimes it’s readily apparent, sometimes it’s not. How you attack the question varies a little depending on whether the argument is good or not so good, so let’s talk about that. Your best strategy for these questions is going to take account of when the question is weak. When it’s weak, it’s a good idea to get a good handle on that weakness before you attack the answer choices. This only takes a moment, but, try to at least articulate to yourself why the argument is not so good. Doing this ahead of time helps you zero in on a correct answer when you see it. It’s kind of like you are answering the question in advance, at least half-way. Powerscore calls it “pre-phrasing”, which is totally a made up term, but it’s a pretty good way to describe what’s happening in your head. I think of it as just coming up with some vague idea of what the answer will look like. On the above example, I’m thinking that this “evidence”, one album selling well because of a collaboration, is weak evidence, and I like to see a principle that says collaborations tend to work again if they worked before, or something like that. That, or maybe I’d like to see definite evidence that it was indeed the collaboration drove the last albums success, and that it will go the same way next time. Thinking this to myself only takes a few seconds, but it puts me in way better shape to find a correct answer among the answer choices. Correct answers on strengthen questions often come in the form of principles, something that takes something specific (like an album selling well once because of a collaboration) and generalize it to a lot of different cases (like saying that collaborations always tend to sell better than solo work). A principle can take a weak premise and shore it up, connecting it more strongly to the conclusion. When you get really good at thinking about the answer ahead of time, you’ll find that it feels a bit like precognition (à la Minority Report). It’s a great strategy because it’s way easier to spot a correct answer (and not get distracted by wrong answers) when you had an idea what that was answer was going to look like ahead of time. Even if the answer turns out to be something way different than you expect, doing a little bit of precogging will help you start thinking about the question dynamically. When you are thinking actively rather than just perusing the answer choices, good things happen. (B) Future collaborations with professional producers tend to do really well after an artist has had success due to such a collaboration. (C) Great musicians who have had very successful solo albums tend to have strong selling albums if they collaborate with other musicians. (A) A looks pretty good, and I think that if I didn’t have a good solid think about the answer before looking at these choices, I might have been tempted to just pick it. However, it’s not quite like my pre-answer. I want something that says that subsequent collaborations with professional producers lead to strong sales again. (B), though kind of awkwardly worded, looks exactly like my pre-answer. It gives us a principle that earlier successful collaborations lead to more. That’s super strong. Even though (A) does strengthen the argument a little, (B) does so more and is the better answer. It says that people in this musicians exact situation do really well. That’s great. (C) is not close. I don’t care about collaborations with other musicians. We are talking about producers. Because I was engaged really actively with the question, I have no trouble spotting why this is a bogus answer. So that’s half the game right there. Think actively about possible ways to strengthen weak arguments, and you find you get the answer easily, almost as if by magic. I heard a quote about chess once that said something like, “A master thinks carefully about his choices and makes a correct move. A grandmaster throws his piece in the air and it lands on the right square.” That’s obviously complete BS, but maybe you get what it’s is trying to say: strong intuition can guide you to the right answer easily. We want you to develop LSAT greatness, not goodness, so work on developing killer intuition. If you think about the answers actively ahead of time when the situation calls for it, this killer instinct will develop. Okay? Now just as often the reasoning in the argument is pretty solid. Then, it’s less profitable to spend much time thinking about the answer ahead of time. Instead just head to the answers. The reason you do this is that there are just so many ways to strengthen a strong argument. So many in fact, that I probably want to add an “advanced strengthen strategies” post soon. For now though, I want to give you the mile-high view, not the ground level view. Here are two types of strengtheners that you need to be constantly on the look out for. This is huge, so if you take one thing away from this post, I want you to remember this section. Remember that your whole big goal with strengthen questions is to show that the premises offered do in fact support the conclusion (that the roof is connected to the walls, so to speak). Often, the passage has left a little teeny tiny gap between the premises and the conclusion. Often, it’s so small that you’ll just gloss over it, even if you are paying attention. However, you MUST learn how to recognize an answer choice that nails things together, even if you didn’t see at first that they weren’t nailed down in the first place. ABDT should not be used to prepare land for rice farming. Physical contact with ABDT, a chemical defoliant, causes headaches, malaise, and joint-pain, and there is evidence that some of these effects are chronic and may persist long after exposure, perhaps permanently. (D) The hands-on nature of rice farming makes physical contact with ABDT highly likely if ABDT is used to prepare fields. When I see this, I might say “OH DAMN” because I didn’t even realize there was a missing connection there until I saw this. Do you see it too? It wouldn’t matter if you used ABDT to prepare land for rice farming if it did not lead to physical contact with the chemical (it might be a problem for some other reason, but not the one given). (D) then strengthens the argument considerably by nailing this premise, (physical contact with ABDT is bad) to the conclusion (should not use ABDT for rice farming), making it clear that the harm is likely to result. This is the pattern to really watch out for. If you spot the gap in advance, that’s all the better, but be ready to pounce on a gap-filler in the answer choices, even if you don’t have a strong pre-answer. Scientist: ABDT is causing health problems among farm workers in Bhutan. Following it’s introduction several years ago, there was a spike in hospital visits for severe headaches and joint-pain in communities where ABDT was being used. (A) Dengue fever, which causes similar symptoms, was at it lowest incidence in years over the same time period. (B) Hospitals kept the same methods for reporting incidences of headache and joint-pain in the five years leading up to the introduction of ABDT use and following its introduction. Like I said before, questions like these are so open-ended that you don’t want to waste time sitting around thinking about the answers in advance. Just get to the answer choices and start eliminating wrong answers. To master LSAT LR strengthen questions, you really need a good handle on causality. Knowing your A —-> B, B —-> C stuff is one thing. Here, you have to have a good plain english understanding of these arguments. The best way to do that is to see a lot of these problems. Unfortunately, for copyright reasons we aren’t allowed to show you real LSAT problems (we’d have to charge you if we did, and lawschooli.com is all about keeping the advice free). Though I’ve tried to give you an accurate approximation, you’ll want to work with real problems a lot to build skills. Read the LSAT LR Bible’s discussion of causality and strengthen questions. It will give you tons of focused practice along with good analysis of the problems. Follow that up with the workbook and you’ll be a strengthen question grandmaster in no time (these books together cover every other LSAT LR question type as well, so you are getting your money’s worth). Thanks for reading and stick with us as we give more in-depth advice on attacking LR questions. Be sure to check out the related posts on other specific LR question types below. Next Article Should You Wait A Year & Reapply to Law School Next Admissions Cycle? I already took the LSAT twice, scoring 167 and 174 respectively. Under most circumstances I’d be happy about my 174 but my GPA is in the 3.4-3.5 range which I believe would put me in a very disadvantageous situation. Should I try to take the LSAT for the third time to see if I can score higher? I’m very conflicted about whether or not taking the test for the third time will have a negative impact on my applications (especially if I score lower). I’m just wondering if scoring above say 177 will significantly change my stats. I think things aren’t as disadvantageous as you might think. Right now there are so few people applying to law school that those are VERY good numbers. While a 3.4-3.5 might have kept have kept you out of the top 6 schools back when I applied, now it’s unlikely to be a problem. UChicago, Columbia and NYU are certainly there for the taking, and Harvard is a possibility. Yale and Stanford are always a dice roll even with better numbers. You have some chance there with your current numbers. Basically, there are very few top LSAT scorers (like a 174) to go around right and schools are competing for them. You are in pretty good shape with that 174. Now is a 177 much better? I’d say not a whole ton. Also, there are just no guarantees you can get it there. Were your practice scores always 177 and above? If so than maybe you have a stronger argument to retake. The most recent repeater data shows 1 person improving from there whereas five did worse on a retake: http://www.lsac.org/docs/default-source/data-(lsac-resources)-docs/repeaterdata.pdf I know that’s a tiny sample size, but most high 170 retakers do worse on a retake. Here’s what I think. Determine what are acceptable options for you in terms of where you get in and with how much scholarship money. Then apply. If, and only if you don’t get good results, then you may want to take the LSAT again in June or later.